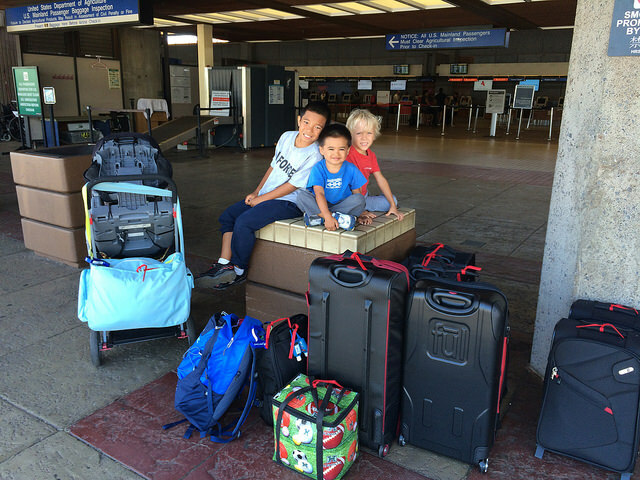 Since we live in Hawaii, we don’t get the opportunity to travel very often as a family. But when we do, you can be sure I never leave home without my VitaMix. Yes, I really do use it that much, and it’s become an essential part of our everyday meals for staying healthy. Here are some things I learned along the way for making traveling with your VitaMix a little easier. It may seem obvious, but don’t forget the Lid, Cap & Tamper! Bring a small amount of dish soap & a towel to keep it clean on the go. Bring your own cups, straws, cutting board, knife & utensils. This was a lifesaver when my son won the trip to DisneyWorld a couple years ago – we didn’t realize that it would be really inconvenient to get the supplies we needed. If you plan on making special meals, don’t forget to pack your recipes! Planning your grocery list before you leave is also a great idea. This way you can quickly pick up or order the things you’ll need. Off the subject, but did you know that Whole Foods has a free personal shopping service & can usually arrange delivery for a nominal fee? I’ve used this before & it was wonderful! If you are traveling to another country, be sure to carry a power converter with you if the power outlets are different. Use your clothes to cushion/pad around the VitaMix Base & Container. I pack things inside the container to use up every available inch of space (like my stevia, seasonings, supplements, etc…). Claim it when you check your bag, and have the airline agent mark your bag as ‘Fragile!’ This way, if you lose your bag or it gets damaged, you’ll have some recourse with the airline. Packing a VitaMix must trigger some alert, because TSA will almost certainly open up and inspect your checked bag. I’ve traveled through 6 airports now with a VitaMix, & every time my bag has been opened up and inspected. I don’t have anything to hide, but take this into consideration when deciding how to pack your base & container. Can I Carry On My VitaMix While Flying? Remove the blade from the container & check only the blade (you can do this with the special tool VitaMix provides). Be aware however that some TSA agents may refuse to let you carry on the motor base. I was told by TSA that each agent has the authority to refuse items at their discretion. If you attempt this, have a small duffle bag ready just in case you have to check it. Ship it. If you kept the original box, then you can easily pack & ship the box. But consider the postage fees & transit times round trip. If you’re like me, I can’t go a day without my VitaMix – so plan this option carefully. Borrow One! The likelihood of having a friend or family member with a VitaMix (or a Blendtec) is good, so don’t be afraid to ask. Pay the baggage fees & check it – don’t forget this means both ways. Not to mention that it will probably take up most, if not all of the space in one piece of luggage. And you’ll have to wrap it VERY carefully so it doesn’t get damaged in transit. This usually is the best option for me simply because I need it right away. My family’s special diets make it very difficult to be without one. I always pray that our luggage doesn’t get lost! Leave it at home. *Gasp! * I know, but maybe your short-term trip is a good time to do a juice cleanse, fast, or let somebody else with a VitaMix make your meals. We’ve discovered so many wonderful juice bars, natural food co-oops & restaurants while traveling… Opening our eyes to creative options we might not have considered unless we broke out of our normal eating routine. Hope this is helpful… If I think of anymore ideas, I’ll post them here. In the mean time, if you have any special tricks or suggestions for making traveling with your VitaMix easier, I’d love to hear them! Have you ever shipped the Vitamix via USPS or UPS in its original box? I still have mine with all the styrofoam but don’t know if I need to have UPS box it within another box with peanuts or if they would say so just to upsell me their materials. I have a 300 series. Thanks! 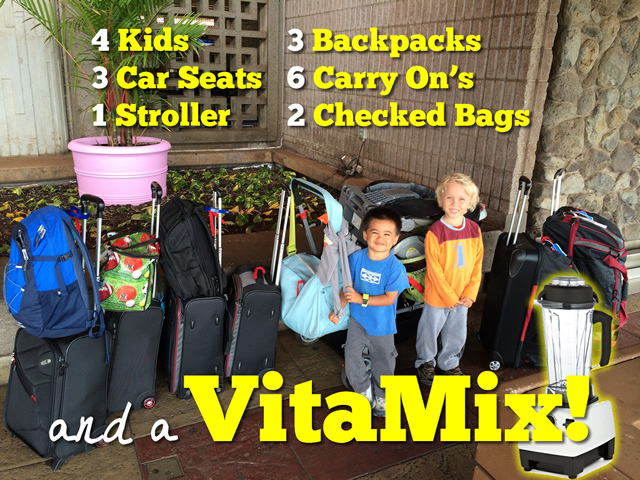 What size suitcase holds vitamix a d everything else? I’m looking at Eagle Creek gear warrior 32″. Is this overkill? I’m used to travelling 9 months a year with an 18″ carryon. But health is suffering from poor travel food. Hi Erika. I’m from Maui and bringing along my vitamix this trip for similar reasons. Wanted to ask, does the vitamix really take up that much space in a suitcase? Have you every had any problems damaging it in transit? Thank you!